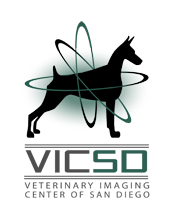 Veterinary radiology is a type of specialty that allows us to look inside and help diagnose your pet, using procedures such as X-Ray, Ultrasound, CT, MRI, and Nuclear Medicine. All of these procedures are non-invasive and do not cause any physical pain to the animals. Why did my vet refer my pet to VICSD? Most advanced imaging procedures performed by a radiologist fall outside the scope of general veterinary care. As an outpatient referral-based specialty center, all of our patients are sent to us from their family veterinarian, who recommends a particular study (or studies) to determine what may be causing your pet to not feel well. Your family veterinarian and our radiologists work together to offer the best diagnostics and treatment recommendations for your pet. Veterinarians also refer to us when their feline patients need I-131 (radioiodine) treatment for feline hyperthyroidism. How does your referral process work? We must have a referral from your pet’s regular veterinarian, so your pet must recently be seen by him or her prior to coming to our clinic. This is just like in human medicine where you must first be examined by your family doctor before going to a specialist, in most cases. To ensure the best diagnostics, be sure to disclose to your vet and to us as much information as possible about your pet’s behavior, eating habits, overall health, and more. Also, your pet must be in stable condition to be seen at our center, since we are not a 24-hour emergency hospital. What are your different payment options? We accept Visa, Mastercard, American Express, Discover, cash, check, and Care Credit. When calling around to different hospitals, it’s a good idea to be as thorough as possible when price shopping. A simple question such as “How much do you charge for an MRI?” can produce a wide range of answers between hospitals. One reason for this is that what is included in the base price—such as anesthesia administration and monitoring—varies from hospital to hospital. Always be sure to ask what is included in the price and what additional charges there might be.